I have a bounty of herbs that came from my garden; it wasn’t hard to figure out what I would do with them. Along with my Basil Pesto, we created this amazing Homemade Chimichurri sauce. 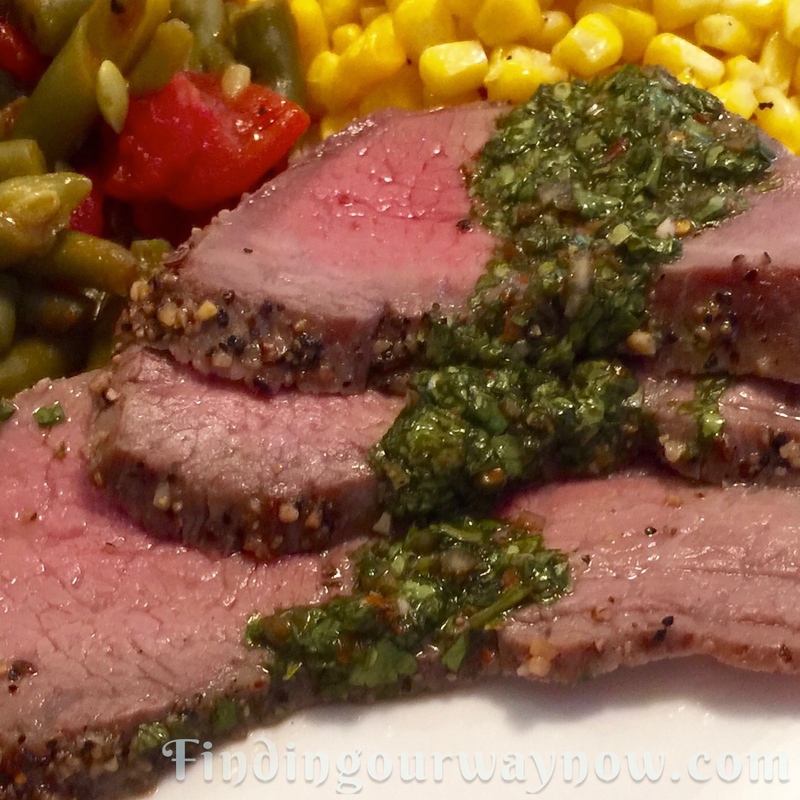 Homemade Chimichurri sauce originated in Argentina, mainly designed as a complement to their great grass-fed beef. Over time it found its way into a number of dishes adding special and spectacular flavor profile. This is my version of a Homemade Chimichurri I think you’d enjoy. Combine the vinegar, 1 teaspoon kosher salt, a dash of pepper, garlic, minced shallot, and crushed red pepper flakes in a medium bowl and let the mixture stand for 10 minutes or so. Whisk in the cilantro, parsley, and oregano until combined. Slowly whisk in oil. Check for any additional seasoning you may require and ladle the Homemade Chimichurri into 4 4oz. jars. Let it rest for 20 minutes at room temperature. After 20 minutes place the jars in the refrigerator overnight or up to 2 weeks. When you’re ready to use the sauce, bring it to room temperature and enjoy. Food Processor Method: Homemade Chimichurri can be made in a food processor by combining the parsley, vinegar, garlic, oregano and crushed red pepper and pulsing a few times until finely chopped. While the food processor is running, slowly pour the olive oil over the mixture until combined. Let stand for at least 20 minutes and then ladle into 4 4oz jars. Notes: The herbs and combinations you use can vary. Some will just use a flat leaf parsley or cilantro, leaving out the oregano. I just happen to like the depth of flavor each lend to this sauce. The amount of heat you may desire is up to you. I prefer a middle of the road spiciness but some like it much hotter. That said if you want to jazz it up a bit, you may use a small amount of fresh diced jalapeño pepper (with or without the seeds) in place of the red pepper flakes. Again the acid can vary as well. If you prefer you can use a red wine or rice vinegar in place of the one I used above. Suffice it to say there are so many ways to vary this sauce that I would be hard pressed to give you all the combinations. 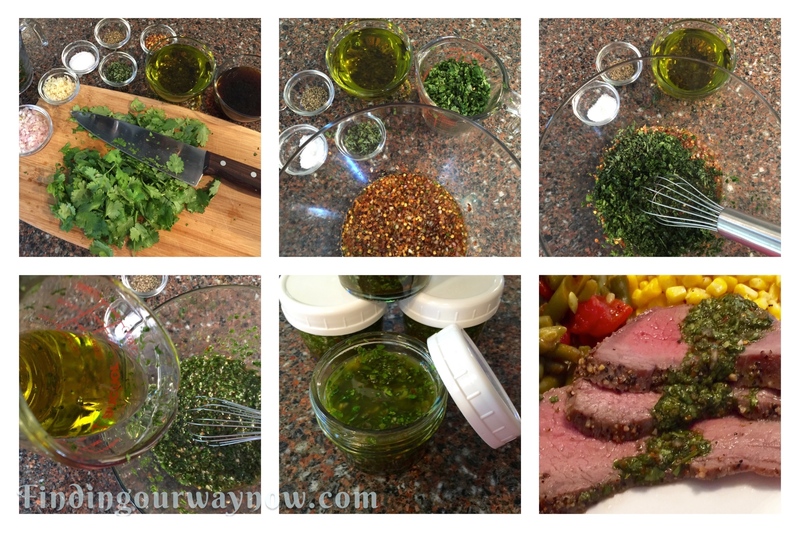 Homemade Chimichurri sauce is incredibly versatile. 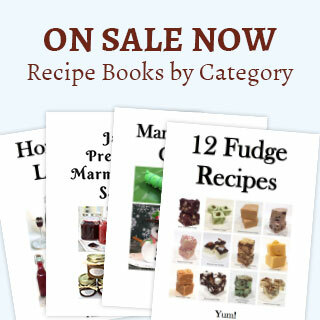 It can be served over a great sirloin steak, tri-tip, skirt steak or a mixed grill. A great complement to that is good Malbec which partners well with a grilled steak topped with very flavorful sauce. It’s also perfect with grilled chicken, a firm grilled fish or seared tuna. If you find yourself with a large amount of parsley and cilantro then this is a recipe you must try. It adds so much flavor to so many main entrées that you may find you can’t do without it. Now it up to you to see that you to give this amazing sauce a try. If you enjoyed my “Homemade Chimichurri,” check out the Basic Homemade Pesto, Hollandaise Sauce The Easy Way, and Preserved Lemons My Way Enjoy.